We celebrated over a 100 peers for their achievements in recovery at the 2018 MHSA Awards on October 25! Our friend, Emcee Infinite, made a beatboxing video that celebrated our peers for the legends that they are. Emcee Infinite is a Bay area emcee, beatboxer, and educator. MGM Grande kicked things off with a lip sync performance that had people on their feet. MGM Grande is also a peer with an incredible story that she told at the MHSA Awards: "Six years ago I moved to San Francisco without a hope or a dream and I quickly ended up on the street ... I started to look into resources, and slowly but surely I climbed back out." By the end of our awards event, peers joined MGM Grande on the stage to celebrate their recovery. Providing peer support that builds community is our key mission at MHASF. After the awards event, we interviewed Ardi about what he first noticed when he started volunteering with us. Ardi often volunteers with Support ⇌ Nurture, which is our program that helps prevent homelessness by assisting people who may be on the brink of eviction for their collecting behaviors. CW was once that person. Now, he is our Outreach Specialist who has impacted lives by sharing his recovery during his ten years at MHASF. This is his story. Like CW, Kim is a SOLVE speaker who helps us reduce mental health stigma by sharing her story of recovery. Kim once felt she had no hope when she was dealing with homelessness and mental health challenges. But now she offers hope to others. 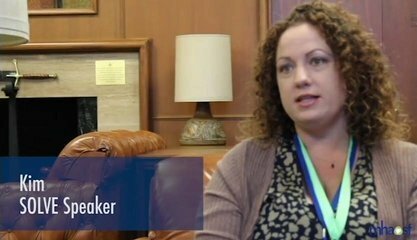 Programs like SOLVE and UCSF Psychiatry's Citywide Case Management changed her life. Thank you to all the peers who shared their achievements in recovery! We celebrate you!